This post is in partnership with Bed Bath & Beyond. All opinions are my own. As a college senior, I’ve had my fair share of dorm rooms by now; from an underground triple (yes, really! ), to a little room in a big city, to a quiet single facing the woods. Even so, I get so excited about decorating my dorm room every year! So when Bed Bath & Beyond reached out to me about introducing you to their college collection, I was totally on board. Today, I’m showing you my dorm style and sharing a few of my favorite new dorm items for this year, featuring Bed Bath & Beyond. 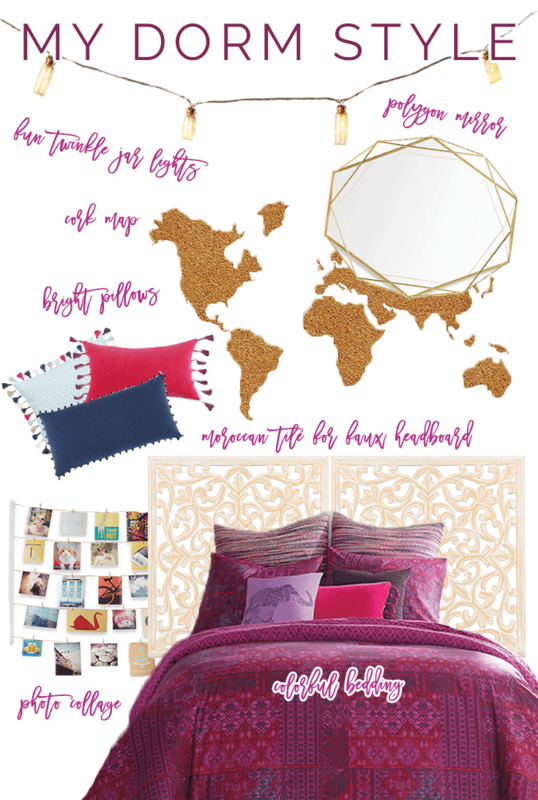 Here’s the mood board I put together for my dorm style. I wanted it to feel vibrant and cozy, with a dash of world traveler (via the cork board map and Moroccan tiles) and reminders of home (from the photo collage). Bed Bath & Beyond was kind enough to give me a gift card to their store, so I picked up a couple of the items from my mood board to decorate my room! Here you can see the mason jar twinkle lights and the strung photo collage, which I filled with pictures and cards from friends. 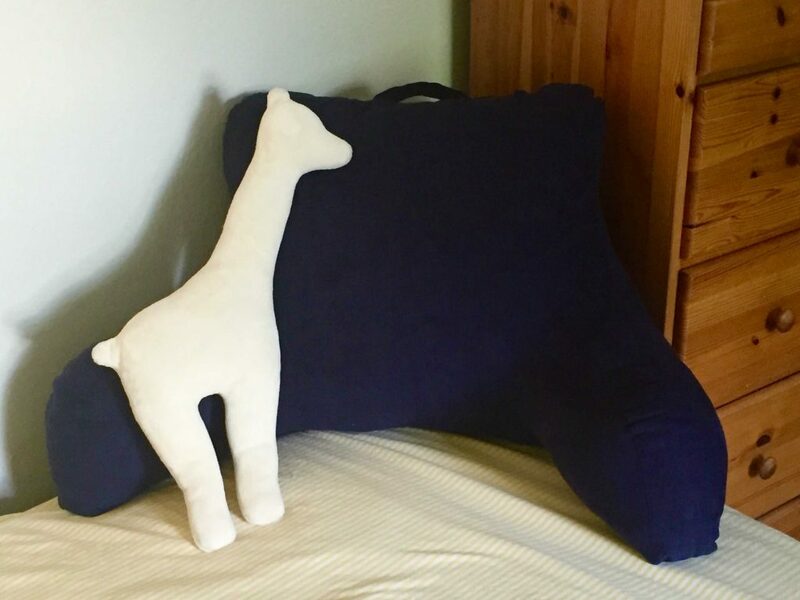 I also picked up a navy blue throw pillow and a comfortable “boyfriend” seat for when I work on my bed. Shopping at Bed Bath & Beyond was really a really fun and easy experience. They had a Student Life Checklist that included all the college living essentials, which made my trip a lot easier. Even better, they also had specific school info sheets available that listed what was and wasn’t allowed in your college’s dorms, what the school recommended for supplies, and even small details like the school’s bedding size. Because I’m a former RA, I knew my college’s requirements by heart, and I was really impressed that the Bed Bath & Beyond school info sheet had them all right! Though my dorm style is focused on bright colors and creative accents, there were tons of options for any style, from feminine to glam to bohemian. The different styles each had options for bedding, decor, and throw pillows. I may or may not have spent several minutes playing with a dramatic mermaid-sequined pillow I found. If you’d like to do your college shopping at Bed Bath & Beyond, you can sign up for their email updates to get a coupon for 20% off one item. I can really recommend it! The room I’m sharing photos of today isn’t my dorm room; it’s actually my room at my parents’ house. 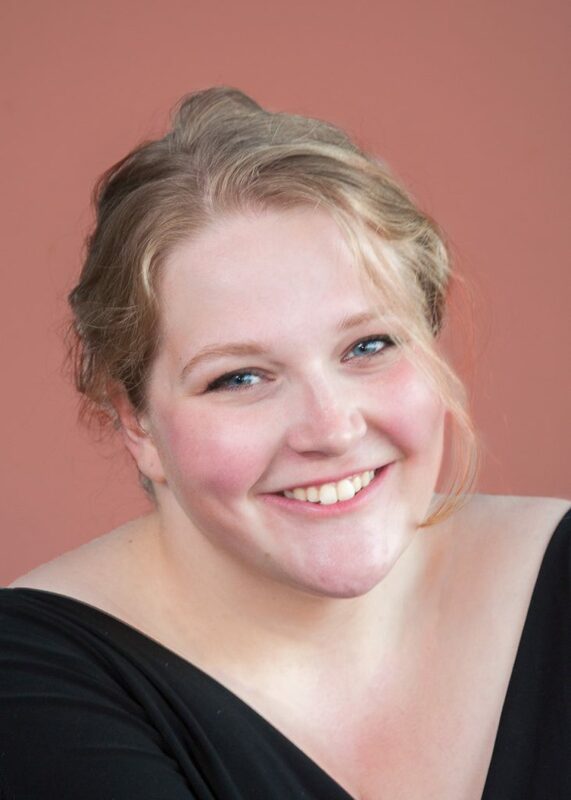 We moved to a new home last year, but because I went away to college soon after, I didn’t have the chance to unpack everything and truly make my room feel “mine.” My walls even stayed bare until my shopping trip yesterday. Adding a few new things made a world of difference, and the same types of items can for your dorm room, too. 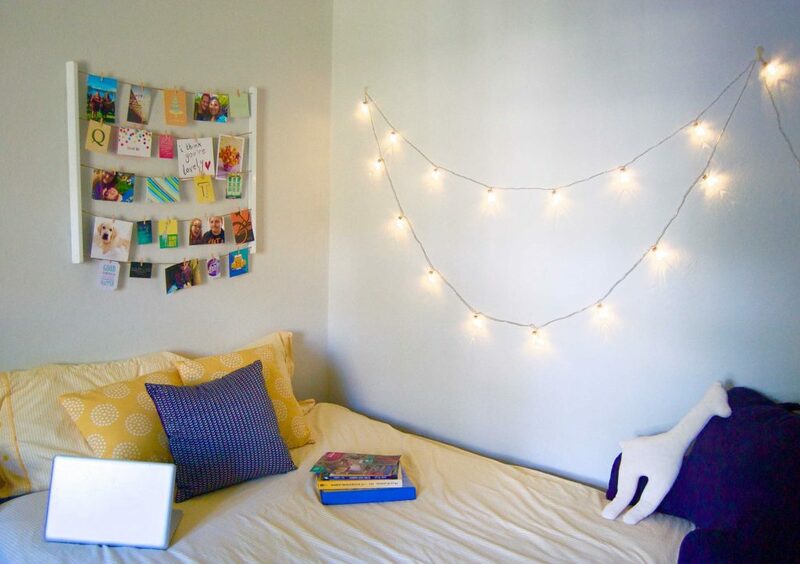 Here are a few tips to make your dorm or room feel homier and more like you! Putting together a mood board really helped me figure out which trends and styles caught my eye. 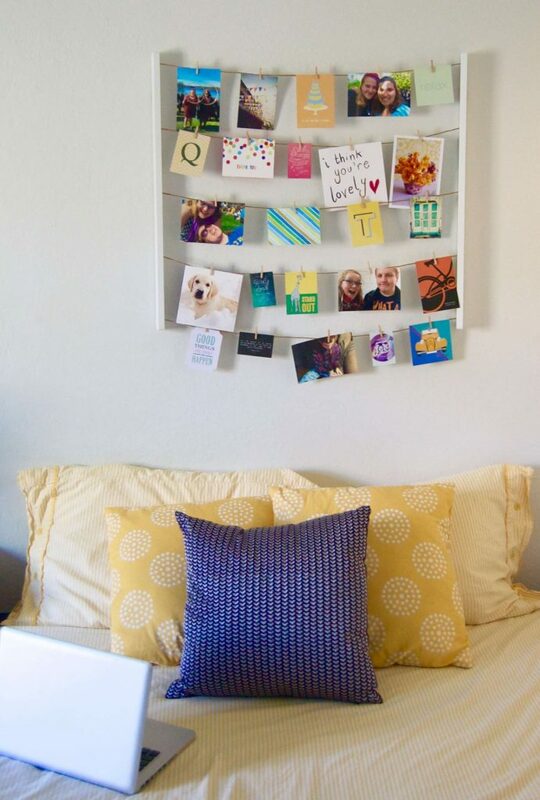 You could make a dorm room Pinterest board for this purpose, pinning images of dorm rooms and decor you like. It’ll help you notice the trends and colors that appeal to you! I chose a fun photo string collage to bring some color to my wall, but you can find something for any style to serve the same purpose. A tapestry or wall hanging would work, or you could use a poster or an eclectic collection of photo frames. Adding throw pillows to my bed, as well as a cozy “boyfriend” seat, was a great way to make my bed comfier and more inviting for hang-outs and study sessions. Twinkle lights are a college classic for a reason! In addition to adding a touch of whimsy to your room, they help make your space brighter. I got mini mason jar lights for my room, but globe lights or other kinds of unique string lights would also be a great choice to add light to your space. Photos, stuffed animals, a cozy blanket from your bedroom: these are all great ways to add a personal and homey touch to a new space. I have brought my childhood stuffed owl with me to college every single year. Don’t be afraid to bring in things from your old life to your new one; chances are, your new roommate will be doing the same! 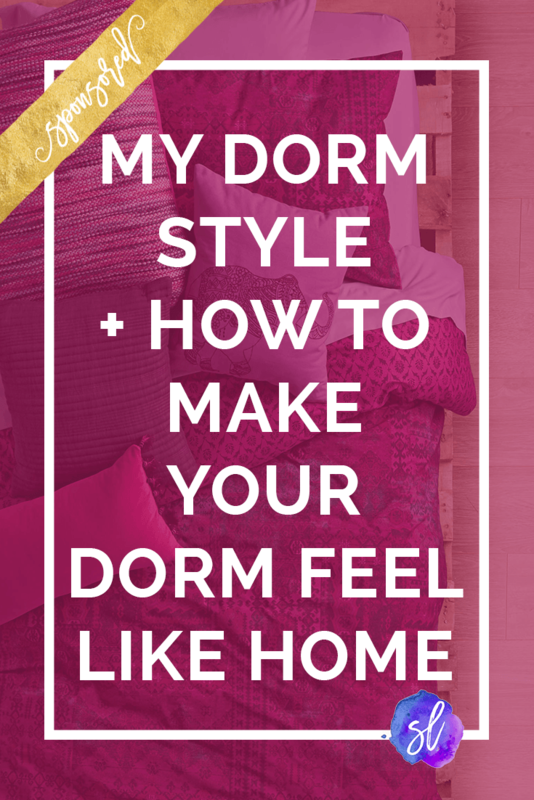 What’s your dorm style? And how do you make a your room feel like home? Bed bath and beyond seems to have all college essentials for students living in dorms! You have such a cute set up! I love Bed Bath and Beyond! They have so many cute things! Your dorm looks so cute too! I’m obsessed with that sequin pillow! haha but great post! I love Bed Bath and Beyond! I’m a college senior as well, but I always did my dorm room shopping at BBB! They have so many helpful employees and a wide variety of stuff! Such a helpful post! BBB has awesome products! Decorating my dorm was one of my favorite things to do in college! BBB is a must for dorm essentials! I love your theme! Decorating my dorm room each year was always lots of fun. So cute!! I love your lights and hanging pictures! Bed Bath and Beyond has some great finds! I always loved when others had lights on the walls in their room, it really is a nice touch. Such great tips. I think throw pillows make a big difference! Great suggestions! Accessories are everything! I love the pillows you picked out! I have twinkley lights in my dorm room too, they definitely change the feel from the florescents! Love your picks! Bed, Bath, and Beyond was always a favorite of mine for dorm decor! My mom put together the comfiest bed for me using a memory foam topper. I also brought along my favorite decor. i still use all of my things from BBB from college! love! I am in love with that cork map and convinced I need it beyond the dorm! I love that your dorm looks so cozy. I’m in an apartment this upcoming school year and I’m definitely going to take some of these tips for my new space, your dorm room is so cute! When I was in college, my dorm style was always fun and colorful with tons of picture frames! I did the majority of my dorm shopping each year at Bed Bath and Beyond! 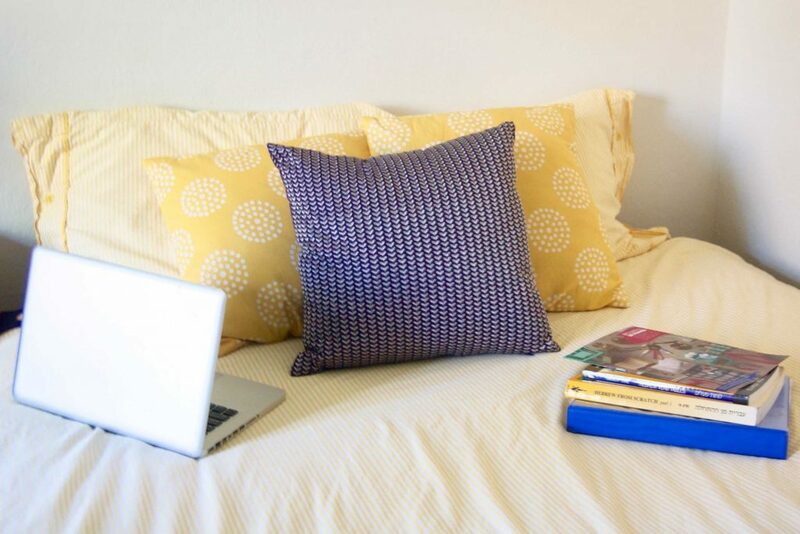 In the past, I’ve always had really simple bedding with colorful pillows and accessories throughout my rooms! I love your moodboard and what you bought from BB&B!